For the former Brooklyn–Manhattan Transit Corporation 1 service, see Q (New York City Subway service). The 1 Broadway–Seventh Avenue Local is a rapid transit service in the A Division of the New York City Subway. Its route emblem, or "bullet", is colored red, since it uses the IRT Broadway–Seventh Avenue Line for its entire route. The 1 operates at all times, making local stops between Van Cortlandt Park–242nd Street in Riverdale, Bronx and South Ferry in Lower Manhattan. The modern 1 train has always run up to Van Cortlandt Park in the Bronx, but its route below 96th Street has varied through the years. In 1918, the modern IRT "H" system was introduced and the earlier trunk line service was discontinued. South of 96th Street, 1 trains either ran local to South Ferry or express to Brooklyn, a service pattern discontinued in 1959. From 1989 to 2005, the 1 ran in a skip-stop service pattern during rush hours, with the 9 providing the complementary skip-stop service on the same route. When the first subway opened between 1904 and 1908, one of the main service patterns was the West Side Branch, which the modern 1 train uses. Trains ran from Lower Manhattan to Van Cortlandt Park via what is now the IRT Lexington Avenue Line, 42nd Street Shuttle, and IRT Broadway–Seventh Avenue Line. There was both local and express service with express trains using the express tracks south of 96th Street. Some express trains ran to Atlantic Avenue in Brooklyn via the Joralemon Street Tunnel during rush hours while all other trains turned around at City Hall or the South Ferry outer loop. On June 3, 1917, the first portion of the Broadway–Seventh Avenue Line south of Times Square–42nd Street (to 34th Street–Penn Station) opened; a separate shuttle service between Times Square and 34th Street was placed into service. On July 1, 1918, this shuttle was extended south to South Ferry, with a shorter shuttle on the Brooklyn branch between Chambers Street and Wall Street. Finally, the new "H" system was implemented on August 1, 1918, joining the two halves of the Broadway–Seventh Avenue Line and sending all West Side trains south from Times Square. As of 1934, all 1 Express trains were running from 242nd Street to New Lots Avenue weekdays and Saturdays during the day, alternating to New Lots Avenue and Flatbush Avenues evenings and Sunday afternoons, and were split at Brooklyn Museum on Sunday morning with the south half going to New Lots Avenue and the north half to Flatbush Avenue. Late night service was not operated. All 1 Local trains ran from 137th Street (extended to Dyckman Street during rush hours) to South Ferry days and evenings, and 242nd Street to between New Lots and Flatbush Avenues late nights. On September 5, 1937, the practice of splitting Sunday morning trains at Brooklyn Museum was discontinued, with the alternate trains going to New Lots Avenue or Flatbush Avenue. On July 1, 1938, all evening and Sunday trains were rerouted to New Lots Avenue. By 1945, all 1 Local peak period trains were cut back from Dyckman Street to 137th Street. Beginning on May 10, 1946, all 1 Brooklyn trains were made express during late nights running on 12 minute headways. Previously all 1 trains ran local from 12:30 to 5:30am and they alternated between Flatbush and New Lots Avenues. On December 20, 1946, all late night trains were routed to Flatbush Avenue, while Sunday service still alternated between Flatbush and New Lots Avenues. On June 12, 1949, 137th Street to South Ferry Sunday locals were discontinued, but were resumed on March 5, 1950, at which time Sunday service was also rerouted to New Lots Avenue. On March 15, 1954, weekend 137th Street to South Ferry locals were discontinued, and simultaneously weekend Brooklyn trains were rerouted to Flatbush Avenue. An attempt was made to extend express service further north on January 14, 1955, when alternate rush trains ran express between 137th and 96th Streets in the peak direction. This proved unsuccessful, and ended on June 28, 1956. Meanwhile, in Brooklyn, weekday trains were rerouted to Flatbush Avenue on December 20, 1957, and evening 137th Street to South Ferry locals were discontinued on May 23, 1958. Under a $100,000,000 rebuilding program, increased and lengthened service was implemented during peak hours on the 1 train. Switching north of 96th Street was eliminated. On February 6, 1959, 1 trains began to run between 242nd Street and South Ferry all times. Trains began to be branded as Hi-Speed Locals, being as fast as the old express service with new R21s and R22s on the line. During rush hour in the peak direction, alternate trains, those running from 242nd Street, made no stops except 168th Street between Dyckman and 137th Streets in the direction of heavy traffic. The bypassed stations were served by locals originating from Dyckman Street. PM rush local/express service was discontinued on February 2, 1959, and morning rush express service was revised on January 8, 1962 to running non stop from 225th to Dyckman Streets and 168th to 137th Streets. This express service was discontinued on May 24, 1976, after which all 1 trains began to make all stops. On August 21, 1989, the 1/9 weekday skip-stop service started. The plan was to have skip-stop service begin north of 116th Street–Columbia University, but due to criticism, most notably that riders did not want 125th Street to be a skip-stop station, skip-stop service operated north of 137th Street–City College between the hours of 6:30 am and 7:00 pm. All 1 trains skipped Marble Hill–225th, 207th, 191st and 145th Streets, while all 9 trains skipped 238th, 215th, Dyckman and 157th Streets. On September 4, 1994, midday skip-stop service was discontinued, and 191st Street was no longer a skip-stop station. After the September 11 attacks, 1 trains had to be rerouted since the IRT Broadway–Seventh Avenue Line ran directly under the World Trade Center site and was heavily damaged in the collapse of the Twin Towers. It ran only between 242nd Street and 14th Street, making local stops north of and express stops south of 96th Street. The skip-stop service with the 9 train was suspended. On September 19, after a few switching delays at 96th Street, service was changed. 1 trains made all stops from 242nd Street to New Lots Avenue via the Clark Street Tunnel and IRT Eastern Parkway Line, to replace 3 trains (which terminated at 14th Street) at all times except late nights, when it terminated at Chambers Street in Manhattan instead. On September 15, 2002, 1 trains returned to the South Ferry Loop and 9 skip-stop service was reinstated. However, Cortlandt Street, which was directly underneath the World Trade Center, was demolished as part of the clean-up and was rebuilt as part of the World Trade Center Transportation Hub until September 8, 2018, when it reopened as WTC Cortlandt. 9 train service was discontinued on May 27, 2005 and 1 trains now make all stops at all times. The skip-stop service made less sense by 2005 because of the increased number of trains being run and higher ridership at the bypassed stations; the MTA estimated that eliminating skip-stop service only added 2​1⁄2 to 3 minutes of travel time (for passengers at the northernmost stations at 242nd Street and 238th Street) but many passengers would see trains frequencies double, resulting in decreased overall travel time (because of less time waiting for trains). On March 16, 2009, the new South Ferry station opened, replacing the original loop station. However, Hurricane Sandy flooded the station, requiring it to be shut down for repairs. Rector Street served as a temporary terminal for the 1 until April 4, 2013, when the 1 returned to the reopened loop station, also serving as a temporary terminal until the new South Ferry Station reopened on June 27, 2017. The 1 runs on the IRT Broadway–Seventh Avenue Line in its entirety. Dyckman Street ↓ Station is ADA-accessible in the southbound direction only. 168th Street A ​C (IND Eighth Avenue Line) Station is closed for elevator maintenance until early 2020. ^ a b "1 Subway Timetable, Effective June 24, 2018" (PDF). Metropolitan Transportation Authority. Retrieved June 24, 2018. ^ a b "IRT Brooklyn Line Opened 90 Years Ago". New York Division Bulletin. New York Division, Electric Railroaders' Association. 53 (9). September 2010. Retrieved August 31, 2016 – via Issu. ^ "I. R. T. SERVICE REDUCED; Week-End Changes Made on West Side Local, Flushing Lines" (PDF). New York Times. April 3, 1954. Retrieved February 20, 2016. ^ "I. R. T. TO SKIP STOPS; Broadway Line to Speed Its Service in Rush Hours". The New York Times. December 20, 1954. ISSN 0362-4331. Retrieved June 15, 2016. ^ "New Hi-Speed Locals 1959 New York City Transit Authority". Flickr - Photo Sharing!. Retrieved June 15, 2016. ^ "WAGNER PRAISES MODERNIZED IRT; Mayor and Transit Authority Are Hailed as West Side Changes Take Effect" (PDF). query.nytimes.com. Retrieved June 15, 2016. ^ "MODERNIZED IRT TO BOW 0N FEB. 6; West Side Line to Eliminate Bottleneck at 96th Street MODERNIZED IRT TO BOW ON FEB. 6" (PDF). query.nytimes.com. Retrieved June 15, 2016. ^ "Announcing 1 and 9 skip-stop service on the Broadway-Seventh Avenue Line" (PDF). The Subway Nut. Archived (PDF) from the original on August 5, 2009. Retrieved August 1, 2009. ^ "The New York City Transit Authority in the 1980s". nycsubway.org. Archived from the original on May 4, 2007. Retrieved May 12, 2007. ^ a b Chan, Sewell (January 12, 2005). "MTA Proposes Dropping No. 9 Train". The New York Times. Retrieved April 18, 2010. ^ "Noteworthy - 9 discontinued". May 7, 2005. Archived from the original on May 7, 2005. Retrieved September 18, 2016. ^ Chung, Jen. "The Number 9 Train's Final Days". Gothamist. Archived from the original on August 25, 2016. Retrieved August 30, 2016. ^ "MTA | Press Release | MTA Headquarters | MTA Opens New South Ferry Subway Terminal". www.mta.info. Retrieved June 15, 2016. ^ "mta.info | Restoring South Ferry Station". November 28, 2012. Archived from the original on November 28, 2012. Retrieved June 15, 2016. ^ "mta.info | Superstorm Sandy: One Year Later". web.mta.info. Retrieved June 15, 2016. ^ "mta.info | Old South Ferry Station to Reopen for Service". web.mta.info. Retrieved June 15, 2016. ^ "South Ferry subway station reopens to public after Sandy damage". NY Daily News. Retrieved June 15, 2016. 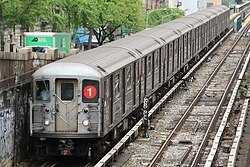 Wikimedia Commons has media related to 1 (New York City Subway service). "1 Subway Timetable, Effective June 24, 2018" (PDF). Metropolitan Transportation Authority. Retrieved June 24, 2018.